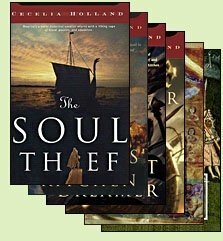 Cecelia Holland's series of novels beginning with The Soul Thief stretches a multi-generational tale of supernatural conflict across the known - and unknown - Western world, covering over six decades of some of the most crucial episodes of the Viking Age. In the first novel, an Irishman named Corban, psychically linked to a sister, becomes entangled in webs of witchcraft and the looming end of Erik Bloodaxe's intermittent rule as King of York. The Witches' Kitchen resumes Corban's story far across the sea before weaving it into the early Danish legends about the historic conflict between Harald Bluetooth and his son Sweyn. The Serpent Dreamer follows Corban across the ocean to the fulfillment of an unexpected destiny amid tribal clashes in lands later known as Vinland. With Varanger, the story moves to the next generation, as Corban's son Conn and nephew Raef are drawn into adventure in the eastern lands of the Rus. There, with Northmen and Slavs forging a hybrid realm, the young men join a campaign of Prince Volodymyr, a key historical figure from history you can look up more easily under the name of St. Vladimir. In The High City the tale turns to intrigue in Constantinople, as Raef and a troupe of mercenaries from the northlands become pivotal players in Prince Basil's aspirations to secure his place as emperor. In Kings of the North Raef heads back toward York, the city where it all began, where a powerful magical entity is striking kings dead and making their successors rise during the early-eleventh-century war between English and Danes. In the Soul Thief series Holland intertwines her tales of magic with some of the most important historical figures of the time. Unless you're allergic to the supernatural, it would be hard to pass up novels offering Holland's trademark insight into unfamiliar mental landscapes, animating a series of thrilling Viking Age tales that everyone should know.